While there are significant potential benefits to migrating to a hyper-converged system, true cost and real life experience are critical decision factors. To accurately establish a case for going to one platform or another, you need a strong fact-based analytical methodology and approach. 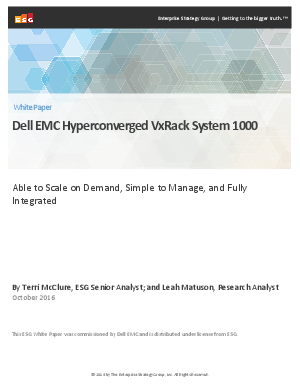 Download this Edison Group white paper to better understand the cost and measureable effort benefits of hyper-converged appliances. Dive into the details for the VxRail Appliance from Dell EMC, including total cost of ownership, total cost of acquisition and relative work efforts to install, initialize and maintain as compared to building your own system.